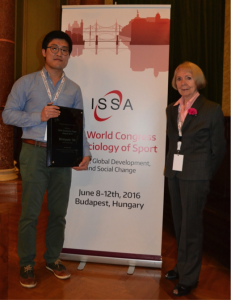 a distinguished international academic career as a sociologist of sport. Individuals who are retired from formal academic positions are eligible for Honorary Member awards. 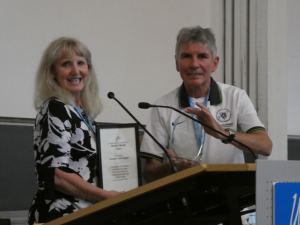 In addition, the International Sociology of Sport Association will consider retrospectively honoring an individual’s service and scholarship with a ceremonial posthumous Honorary Member award. Free, lifetime registration to the International Sociology of Sport Association’s annual conference. View a list of current Honorary Member. Nominators should submit a 1 to 2-page document (letter) by March 1, 2019, that describes in as much detail as possible how the nominee meets the International Sociology of Sport’s Honorary Member criteria. Submit nominations by email to Cora Burnett atawards@issa1965.org. The aim of the International Sociology of Sport Association’s (ISSA) Graduate Paper Award is to recognize the scholarship of outstanding graduate students in the international community of sociology of sport. The award will be granted to a scholarly paper, authored by a graduate student, which is deemed by a panel of judges to demonstrate considerable originality, critical and analytical ability, and to be of the highest quality from among those submitted1. 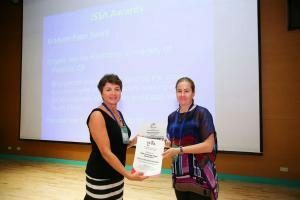 The winning author will be invited to receive the award and present or distribute the paper at the annual conference of the ISSA. It must be a single-authored paper. The student must be a member of ISSA at the time her or his paper is submitted. The committee will accept only one submission per author. Previous winners are not eligible. A paper cannot be considered for the ISSA GPA award at the same time that it is submitted for another award. The winning author will be invited to present or distribute the paper at the ISSA World Congress of the Sociology of Sport in Dunedin, University of Otago, New Zealand, 24-27 April 2019. While the registration fees for the winner are included in the prize, participation in the 2019 Congress is not mandatory. The winning author will receive an ISSA sponsored prize of membership in ISSA for 12 months. The winning author will receive a SAGE Publisher sponsored prize of £150 worth of books. The panel of judges may also give up to two honourable mentions. Graduate students receiving honourable mentions will also have their papers accepted for presentation or distribution at the ISSA conference. The name of all winning authors will be posted on the ISSA website (see, www.issa1965.org/awards). Candidates are to submit a 3000-6000 word (excluding references) scholarly paper on a topic that is of interest to the international sociology of sport academic community. Papers with a text of over 6000 words will not be considered. Authors are to submit a cover page that contains the title of the paper and the full contact information of the author. The author’s identity must not be recognizable in the text. Authors must be graduate students at the time the paper is submitted. Authors must be members of ISSA at the time the paper is submitted. Authors are to submit a letter, signed by her or his academic advisor, verifying graduate student status. Authors are to follow a style consistent with the publication guidelines for the International Review for the Sociology of Sport. Papers should be submitted electronically (in Microsoft Word format attachment) to the Awards Committee Chair, Cora Burnett. All papers should be emailed to awards@issa1965.org. Deadline for Receipt of Submissions: December 31, 2018. The winner will be announced by March 1, 2019. 1 The ISSA reserves the right not to grant an award in the event that none of the submitted papers meet the award criteria. Photo: Minhyeok Tak (University of Otago), Gyongyi Foldesi Szabo from Hungary (ISSA Honorary Member). Paper title: “7 days in Srebrenica: Seeking the reality of playing together in post conflict Bosnia and Herzegovina”. No award was presented given that the ISSA Congress was held in conjunction with the ISA World Congress of Sociology in Durban, South Africa.